The Franco-German relationship is the motor propelling the European project, but the two countries have become increasingly unable to find common ground to overcome the European Union crisis. The new French president Emmanuel Macron and German Chancellor Angela Merkel have claimed their main objective to be resetting the Franco-German axis and starting a new cycle of European integration. What are the prospects of these plans ? Before examining alternative scenarios, a clinical diagnosis of the situation needs to be a prerequisite step. To rescue the European project, which faces an accumulation of unresolved crises, it may be necessary to break taboos and focus on the reality that a new geopolitical rivalry has emerged between France and Germany after Germany’s unification. 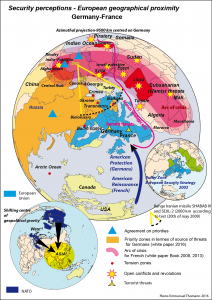 In French geopolitical representations, the rivalry is a result of EU expansion to the East, and a shift of the EU’s geopolitical centre towards Germany with the reinforcement of German power in EU institutions. Not reflecting on the new rivalry and its underlying implications is the source of the European Union’s multiple crises. The European project was initially aimed at resolving the historical Franco-German rivalry, but it is still ongoing today as much as at the beginning of the European Union. The Franco-German relationship’s role in political communication is to broadcast the image of a pacified and equilibrated interrelation. This was useful for France to hide the asymmetry between the two countries after German unification, and useful for Germany not to appear as a dominant power in the EU. Presently, this unaddressed reality has reached its limits for resolving internal and external common geopolitical challenges. The French perception of a shift of the geopolitical centre of gravity towards the East in favour of Germany has led to compensation measures by France regarding enlargement and neighbourhood priorities. Within an enlarged EU, different geopolitical priorities and security perceptions make it difficult to delimit EU interests, and therefore predictability. There is a new Franco-German rivalry deriving from the objective of both nations to position themselves at the geopolitical centre of the European Union. They both look for security, to be surrounded by allies, and to be able to exert power from a central position (see map "Franco-German Great Game after German unification” ). After German unification, Germany's drive to enlarge the European Union pushed French governments to develop strategies of compensation to counterbalance Germany. The changing geopolitical priorities of Germany and France throughout time are illustrated on the map. After German unification, a main German priority in 1995 was to expand towards Austria and the Nordic countries. France and Spain reacted with the Barcelona process proposal towards the Mediterranean to rebalance the geopolitical priorities of the EU. Germany's next priority was to enlarge the EU to Central and Eastern Europe, while France reacted with an acceleration of enlargement towards Romania and Bulgaria. In 2007, with the European Neighbourhood Policy (ENP+), Russia and Central Asia became the main priorities of the German EU presidency. 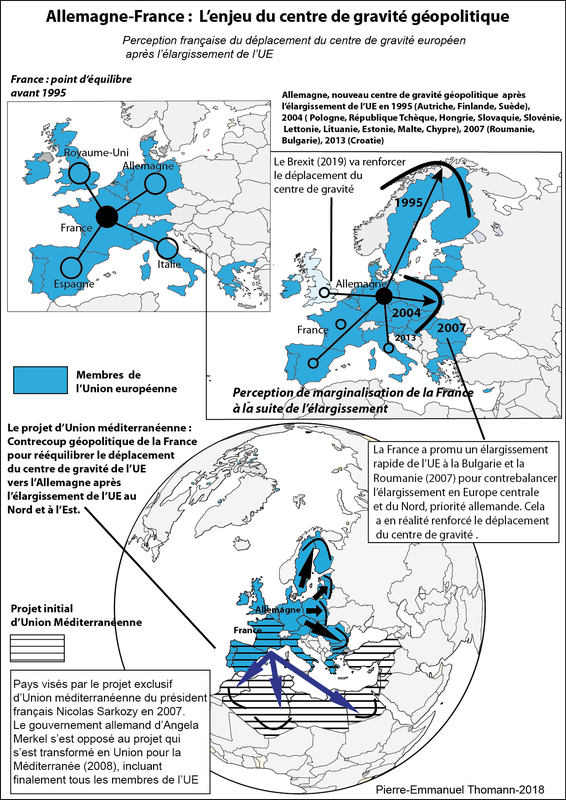 In 2008, The French government proposed the Mediterranean Union project to re-orientate the EU towards the South. As a reaction, the Eastern Partnership was proposed by EU member states from Central and Eastern Europe, and supported by Germany. 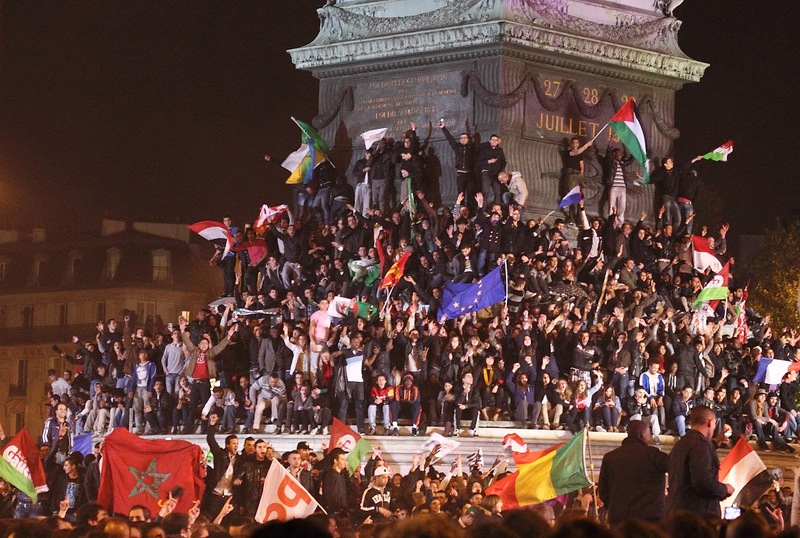 When Arab revolutions erupted in 2010, France proposed to re-launch the Union for Mediterranean/ Barcelona process. 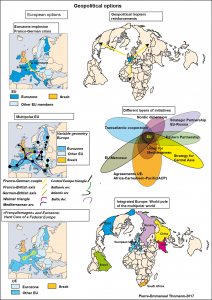 The dynamics of rivalry between France and Germany (and between North-East and South–West EU) over the geopolitical orientation of the European project became a central factor in the EU Neighbourhood policy. In the 2008 French white paper, an arc of crisis (From Morocco to Afghanistan) was identified and revealed the French security perception as well as France’s main priorities concerning military interventions. In the new German white paper (2016), Russia has been identified as a challenge to European security order. Although French and German security perceptions do of course overlap, there are thus significant differences. 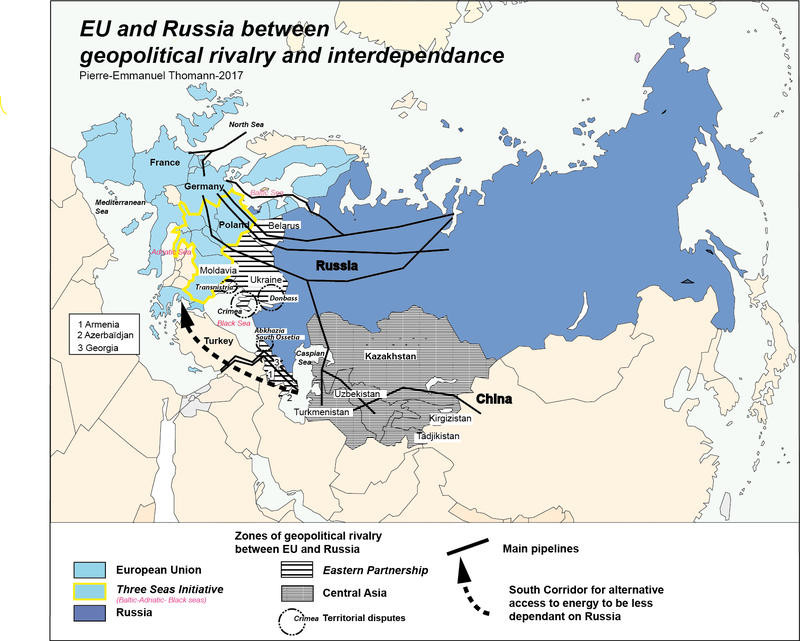 When one observes the situation in relation to the different geopolitical priorities of France and Germany, it becomes clear that Germany as the "central power" of the EU is more preoccupied by destabilisations on the Eurasian continent and in the Balkans, whilst France is more preoccupied by crises in North Africa and in the Middle East. Although the big patterns of security perception are different, Germany and France agree on certain 0policies within EU like Iran (priority was given to negotiations on the nuclear question) and Russia (priority was given to EU sanctions and diplomacy regarding the Ukraine crisis, although France is more eager to lift sanctions, but not at the cost of an open Franco-German and Transatlantic rift). At a global level, France and Germany, like other EU member states worry about the shift of the global geopolitical centre of gravity from the "West" to Asia. The new French president Emmanuel Macron made his first international visit to the German Chancellor Angela Merkel in line with diplomatic tradition of Franco-German relations. Since the time of de Gaulle-Adenauer, all French presidents and German chancellors have promised a reset of Franco-German relations at the beginning of their mandates. The relationship has never been easy throughout history. 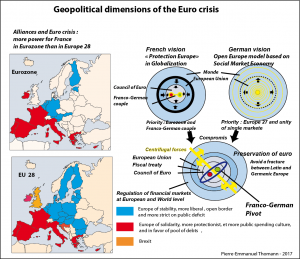 The proposal of the new French president for a new integration cycle for the Eurozone must be considered from a geopolitical viewpoint (See Map: Geopolitical Dimension of the Euro Crisis). The Franco-German deals, aimed at preserving the euro to avoid European fragmentation, position the Franco-German relationship as a point of geopolitical articulation in the European Union. At stake is the geopolitical centre of gravity of the European Union revealed by the Franco-German rivalry. For the resolution of the crisis, the French are promoting a reinforcement of the Eurozone but the Germans favor the unity of Europe 28 (27 EU members after Brexit). Since the implementation of the euro, the French government has continuously promoted a "European economic government" to lead the Eurozone. The underlying objective, in alliance with South Eurozone members, is to push for a more balanced power distribution to Germany. However, this creates contradiction, as Germany is geographically located as the centre of the EU. Germany is unwilling to cut itself off from the Eastern and Nordic flanks, as Nordic, Central, and Eastern European countries represent added value for economic reasons, and position Germany as a European central power. The "multispeed Europe” scenario, proposed by the president of the European Commission Jean-Claude Juncker, would be very difficult to institutionalize for this same reason. Behind these differences lie differentiated German and French national representations regarding the market social economy and the posture towards globalization. Germany, as an economic power, sees the European Union as an open space of economic flows and a sub-grouping of the liberal globalization process. France is promoting the EU as a European superpower with strong borders for European integration militants, or the model of "Europe of nations" for more realist political actors. German interest, as a central and economic power, lies more in avoiding EU fragmentation and exporting the German economic model (Ordo-liberal rules) to all the 27 EU members (after Brexit). After the next German elections, there will no consensus to transform the European Union into a "Transferunion". This term describes the German perception of financial transfers from their budget to Southern EU members through reinforced programs of solidarity. They fear that a French promoted "Eurozone economic government”, and a Eurozone mini-parliament with its own budget would further push the EU towards this French goal. Resetting the Franco-German relations will not change this reality. The Euro-crisis is a solidarity test against globalization between French and Germans whose respective visions, a hub of globalized networks against a protective Europe, diverge. 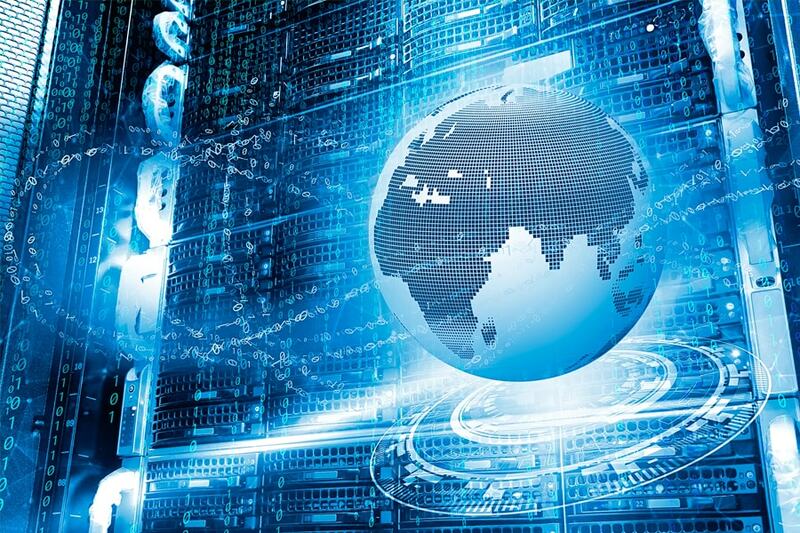 New plans will not resolve the core geopolitical problem. The "Merkel Plan" negotiated in 2016 to resolve the migration crisis was largely a German-Turkish deal promoted by the Dutch presidency. It was negotiated behind closed doors, before the EU summit, with the exclusion of France. This episode was an unprecedented act and further damaged the Franco-German axis. Historically, the rule in EU negotiations has been to find a Franco-German political agreement before any deal is hammered out at EU level. As far as the migrant crisis is concerned, it is important though to stress that French government actions were as disruptive as the German government decision to open the borders: French governments share a large part of the responsibility for the destabilization of the Middle East and North African region with their promotion of regime change in Libya and Syria, in alliance with the United States. It has resulted in the destruction of states modelled on the nationalist and Laic Arab nation-state model. This model is now being replaced by the rise of Islamic fundamentalist factions and civil wars are provoking huge migrations flows. Brexit will have irreversible consequences on the balance of power within the EU. The balancing role of the United Kingdom traditionally used by France to counter German influence will be diminished after Brexit. In the French Gaullist doctrine, Russia is a factor of equilibrium in Europe and this role is likely to be reinforced after Brexit. Europe will find itself in a geopolitical situation similar to the period when de Gaulle was president of France: UK was not part of the European economic community and the Cold War was causing deep European tensions. Today, Brexit is also concomitant of a "new Cold War" context. As a result of Brexit, the shift of balance of power within the EU will tend to reinforce the centrality of Germany. This, in turn, will raise France's desire to consider new options to slow down what the French perceive as the emergence of a "German EU". French politicians, influenced by the Gaullist doctrine are likely to promote a better relationship with Russia and the United States, in order to re-establish a better geopolitical balance in Europe (the new French president Emmanuel Macron invited Vladimir Putin in Paris the 29th of May, Donald Trump for the 14 th of July in Paris, in a diplomatic move that is looking like a repositioning of France within the Quadrangle USA-Russia-Germany-France). The acceleration of European integration to resolve the Franco-German rift is a recipe for failure. Structural and geopolitical differences between France and Germany cannot be dissolved in EU normative and institutional functionalism. The objective of the new French government consists of reforming the French economy according to EU rules to regain credibility. This move is aimed to foster German openness to French ideas, like a "European economic government", higher economic protection and common investments at EU level. As examined above, it is doubtful that this strategy will create expected results since the problem is not due to economic fluctuations, but due to the geopolitical dimensions of the Eurozone crisis. The chosen tactic of French unilateral reforms, anticipating German concession, is not in line with the "give and take" negotiation process and positions France as the minor partner. French reforms are needed, but simultaneously, the reform of obsolete EU normative tools is also necessary. There will be no flexibility for compromises if French and German governments abide to EU intangible norms. 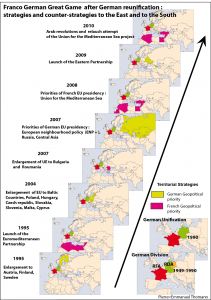 Additionally, the strategy may aggravate Franco-German asymmetry within the EU. The European economic government proposed by France, if implemented with no EU reform, will end up France aligning on a German economic model ill-suited for France. This tactic would not be well suited to France’s need to re-industrialise and would result in more German frustration from resulting financial transfer to other Eurozone members. France and Germany should return to the spirit of the Franco-German treaty negotiated in 1963 by de Gaulle and Adenauer, when the Franco-German equilibrium was a main premise for the European project, and the objective was to reach more strategic autonomy. The European project needs also to be adapted according to the changing geopolitical environment. After Brexit and its consequences, the EU should focus more on "Realpolitik" principles since it will be less and less in a position to impose its paradigm based on the "interdependence theory" and the exportation of its own norms. The European project should rather be understood as a wide European security architecture, such as the "Westphalian peace" or "Congress of Vienna". To transform itself into a serious political player in a rapidly changing world, a reformed European project needs to embrace the "Europe of nations" model and devise a geopolitical strategy based on its territorial interests. This means defining its boundaries, geographical priorities and alliances, and promoting cultural characteristics – both organic and ideological values – that will prevail within these boundaries, to have more weight in the world order. France and Germany should consider disagreements as a useful sign of counterproductive policies. For example, Germany was right not to participate in the Libya war since it destabilized North Africa. France was right not to implement compulsory quotas from migrants since mass migration will pave the way for more cultural conflict on European territory. The idea of a fully integrated European defence is not realistic. Coalitions of the willing from sovereign nations and cooperative projects on common capabilities between national defence forces, instead of grand fusions, are more likely to preserve the national margins of manoeuvre. If France and Germany can work on a common diagnosis of the geopolitical situation in Europe and at global level, they can move on and agree on a common security doctrine, and geostrategic and economic priorities. A coalition of volunteers is likely to be more adaptable since the EU framework is hampered by overstretch and paralysis with 27 members and normative rigidity. Only when a common Franco-German position emerges, can EU consensus possibly be obtained within the 27 member countries. To achieve more balanced Franco-German relation in terms of foreign and internal security policy, a more realistic approach and a change of scale would be wise. The EU level is now too small a framework to give Germany and France the geographical space and thematic scope to develop potential alliances and projects. This is why it is also important to avoid an exclusive "Euro-Atlanticist" vision. This scenario would fragment Europe even more and cut a reformed European project from the Euro-Asian, Euro-Mediterranean and African, and Euro-Arctic geopolitical spaces. Therefore, Brexit can be seen as an opportunity for continental EU member states to take full advantage of the emerging multipolar world. 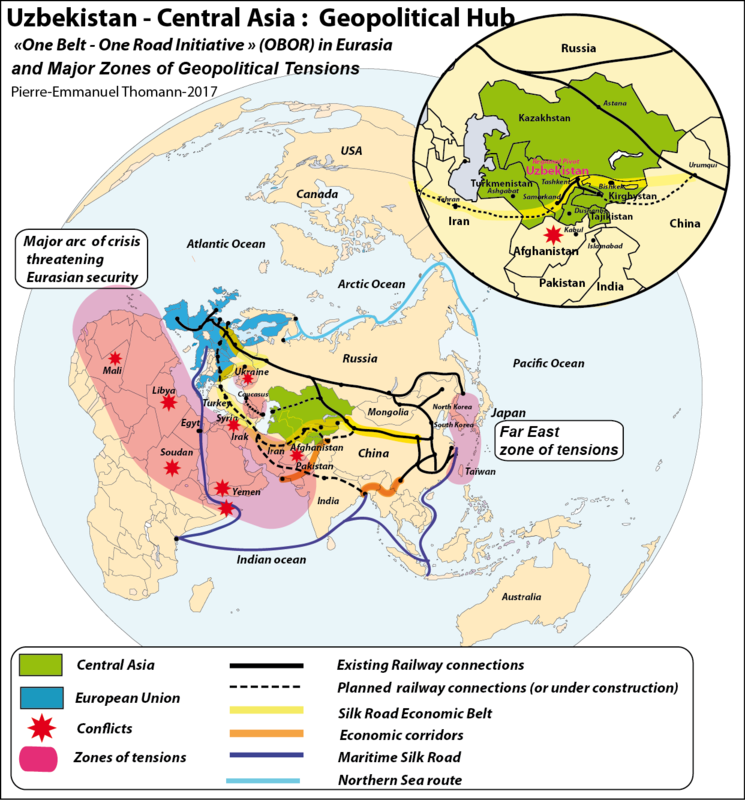 Germany and France should push for the "Europe from Lisbon to Vladivostok" scenario in the longer term with Russia and position themselves towards the "One Belt One Road" (OBOR) initiative from China. The "open border" ideology is out of date considering new security challenges. Borders are a marker for sovereignty and territory control. Borders are required to the counter mass migrations that can further civil conflict on EU territory. France and Germany need to negotiate a new set of selection processes at EU and national borders to firmly contain illegal immigration. European and national economic preferences and a policy of strategic industrial protection should not be a taboo anymore. Different schematic scenarios can be identified for the European project's future (See map: Geopolitical Options). The dream of a federal Europe is a utopia, since neither France or Germany are willing to lock themselves in a rigid institutional structure. Germany refuses to let the EU transform itself into a Transferunion, and France is unwilling to let itself be bound in a federal Europe with an asymmetric power distribution at its core. The scenario of an EU implosion is also still a possibility, if the EU is not reformed on a sound and sustainable base on which both France and Germany can build and combine long term national interests. 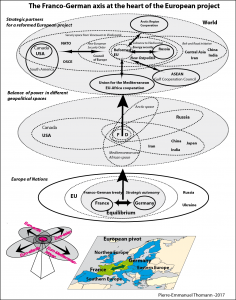 The most realistic scenario is a "multi-polar Europe" model based on geopolitical equilibrium. It is the most appropriate scenario to contain European centrifugal forces, and avoid deeper fragmentation deriving from utopian and unrealistic integration plans. To promote this realistic scenario, France and Germany need to apply a new doctrine of power balance, instead of trying to impose their own model for Europe onto one another. They have to find new glue for their relationship. The reconnection to their shared European identity, while focusing on culture and security, would be a most appropriate start to revitalising cooperation, at a time where globalization is a fight to carve up geopolitical spaces. Brexit should be seen as an opportunity to reform the European project and make it more tangible and transparent to its citizens: this means less integration, but more cooperative projects. The Franco-German rivalry has always been the engine of the European project, but always equally limiting. Charles de Gaulle and Konrad Adenauer’s realist ideas should prevail again over Jean Monnet's federalist vision.